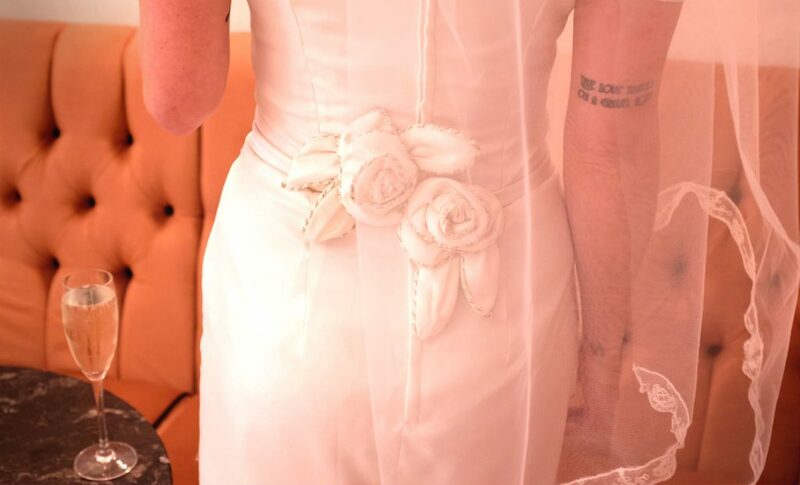 I have been so excited to publish my wedding dress refashion. Earlier in the summer, the wonderful Portia Lawrie invited me to join this year’s Refashioners project, which celebrates the art of upcycling unloved/unwanted fabrics and garments into something new and wearable. Currently, the world is drowning under an impossible sea of waste with the fashion industry being one of the primary culprits. Essentially, we buy too much and throw away what we think is broken, unfashionable and unwanted. The aim of The Refashioners challenge is to show how we can minimise waste by using and repairing what we already have. Mending, upcycling and completely refashioning unwanted garments is a crucial way to prevent waste as well as rejuvenate your wardrobe. When Portia invited me to join The Refashioners she hinted that this might be chance for the Refashioners to see the first wedding dress refashion. I can’t deny I was excited at the chance to get my teeth stuck into a wedding upcycle. 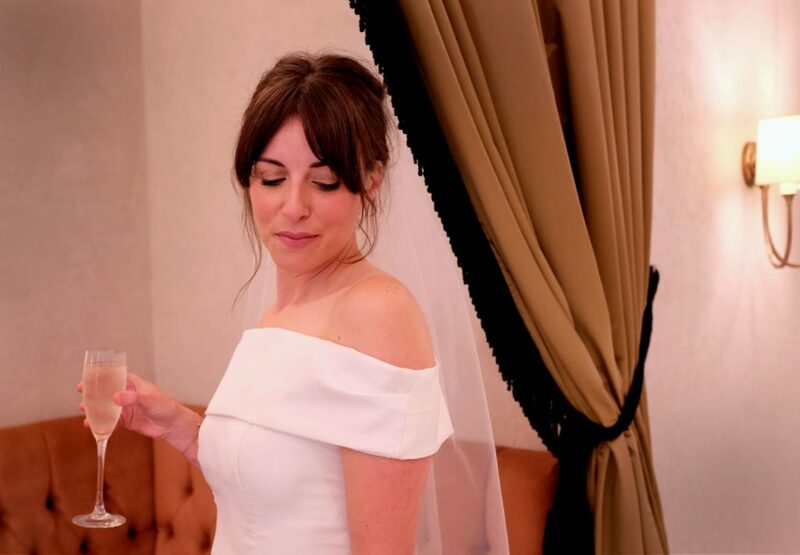 I have been supporting the drive for sustainable fashion for some time now, yet working in bridal, it’s clear there are very little options that are ethical and sustainable. I’ll be publishing a blog post in the very near future that will delve more into this. So, please stay tuned for that! Before I set off to find a bridal gown in need of a wedding dress refashion, it was important for me to set myself some ground rules. 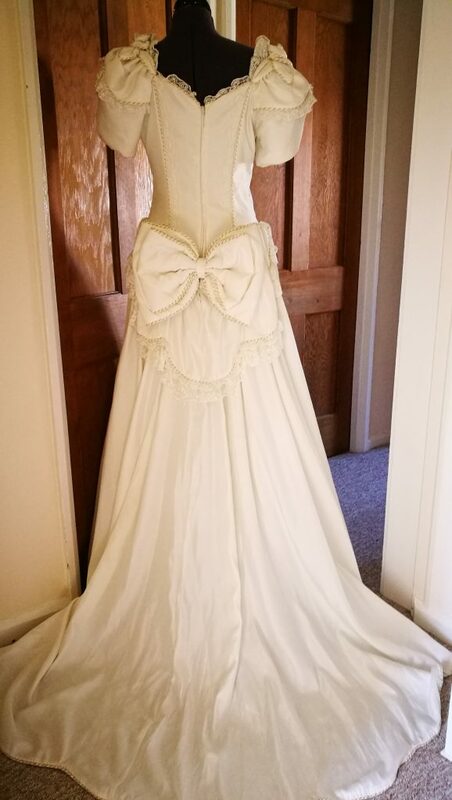 I didn’t want to buy a second-hand or vintage wedding dress that could still be bought by someone and worn for their wedding day. I wanted to make sure the dress I bought was a lost soul, unloved and in need of a dire make-over. A quick trip to my local Salvation Army in Cambridge proved to be destiny. There, taking up almost a whole rail was this once beautiful 1980s monstrosity. We’ll name her Di. I checked with the shop staff about how long this dress had been in the shop. Quickly, the lady said “Months and months. Please, please take it.” And, for a princely sum of £17, she was mine. Now, I won’t give poor Di too much of a bad rap because at one time, she was someone’s treasured wedding dress, but yikes, just look at her. When I sent Portia a little sneak preview of my starting garment for the wedding dress refashion, she replied “Princess Diana has a lot to answer for.” A true testament of her time, Di has all the trimmings. Made in a polyester Dupion-style fabric, it features huge, padded, puff sleeves (padded with polyester wadding may I add), full, gathered skirt, garish lace, even more garish piping that would be at home on an ugly sofa or cushion, and a HUGE HUGE bow on the back. After I got Di home, I stuffed her away and went on holiday. Woo, there was a lot to think about. To be honest though, it didn’t take long for inspiration to strike. I decided that my Refashioners project would be inspired by and in tribute to the divine Meghan Markle and her fashion unity with the house of Givenchy. In particular, my main inspiration is a merge of her wedding dress and a dress she subsequently wore on her first Royal engagement alongside the Queen. Both dresses being made by Givenchy. For a while now, I have admired Meghan Markle’s polished style. Choosing classic silhouettes, she is every bit the modern Princess, working with designers from Givenchy to Stella McCartney. Most notably though, as Radhika Jones writes in the latest issue of Vanity Fair, Meghan Markle is “duchess of the boatneck” and this is what I wanted to recreate most in my refashion. Such perfection! 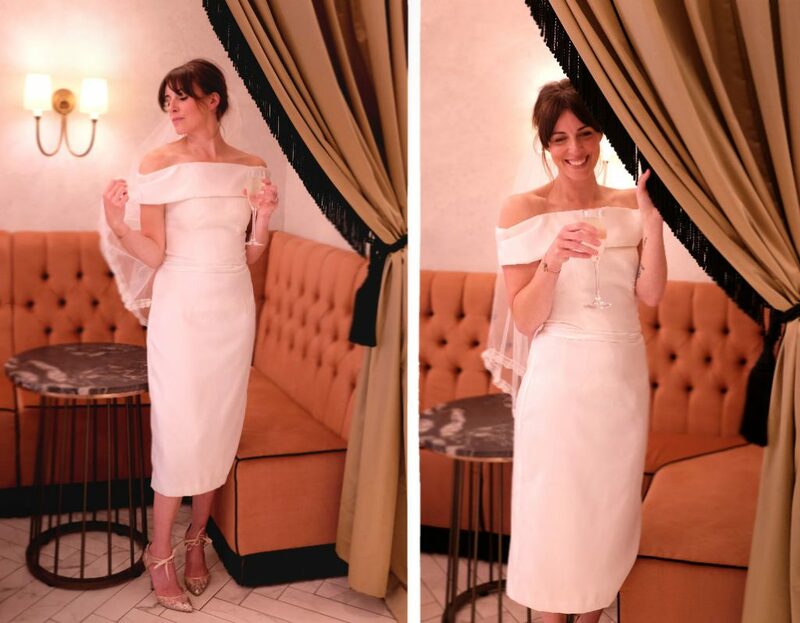 I started to sketch some ideas and decided that Di could be transformed into a combination of these two dresses, creating a ‘modern vintage’ wedding dress that was wearable, sophisticated and most importantly, a keepsake. I wanted a ‘Bardot’ style neckline, which was a merge of both dresses complemented by a classic, fitted pencil skirt. I achieved this wedding dress refashion by essentially unpicking every section of Di. This was a huge job and took longer than I anticipated. Every seam on the bodice had been stitched forming a sandwich of fabric, lace and piping. So to remove the lace I had to unpick everything. However, once it was done I could see what I was working with and could begin to piece it back together. I kept the original bodice but added boning to all four princess seams because now that the sleeves had been removed, the bodice needed support so that it wouldn’t sag. Using rigilene boning, the dress bodice now has structure and stability without feeling too confined. Rigilene boning can be sewn directly to the fabric or inserted within a ‘channel’ often made from bias binding – it’s a great, easy way to create support. For the ‘off the shoulder’ panel at the top of the dress I used fabric from the large bow on the original dress (sorry bow!). The bow had basically been constructed from a rectangular piece of fabric so it was perfectly on grain and also in good condition. I added the slight pleats on the front panel near the shoulder seam to create a little dimension and movement. Additionally, I used the original dress zip and kept to a lapped zip seam for vintage effect. For the waist trim, I used the reverse of the poly Dupion. Fortunately, the reverse side was a lovely satin effect, which worked perfectly for the belt. I would have liked to have used more of this satin-style fabric but it just didn’t work well with the minimal, matt aesthetic of the two Givenchy dresses that I was inspired by. To create the pencil skirt I drafted a simple skirt block and fitted it to my desired tapered style. I used the on-grain sections from the original skirt to ensure the skirt was uniform to the bodice. In respect to the original dress, I really liked the ornate fabric flowers that were once part of the monster sleeves. I chose to add them to the back of the dress on the junction of the waist and zip seam. It was a small tribute to that crazy original bow, keeping a small part of Di in the new dress. I have a nice amount of original skirt fabric left, which will definitely not go to waste. I had great plans to make a matching vintage style cape to go with the new dress (incorporating that piping in a super cool way), but sadly work and a lack of time got in the way. Oh and those puffed, padded sleeves? They’re currently a work in progress and will become a cool boho bag inspired by a recent image I saw on Instagram. Stay tuned! My last part of the wedding dress refashion was making use of all the lace that I had unpicked from the seams. Inspiration struck again when looking at The Duchess of Sussex’s breathtaking veil. A staggering 16 feet, the veil featured intricate embroidered lace, which represented the signature flowers of all countries within the Commonwealth, of which the Duchess will be working with throughout her Royal duties. I knew that in my ‘inspired by’ piece, I’d have to recreate the veil in some form. Although I decided to make my own veil, I didn’t want to nor did I have the resources to make a veil of those proportions! Instead, I decided to match the veil to the style of the new dress. With its soft, 1960s vibe the dress required a shorter more vintage-style veil. 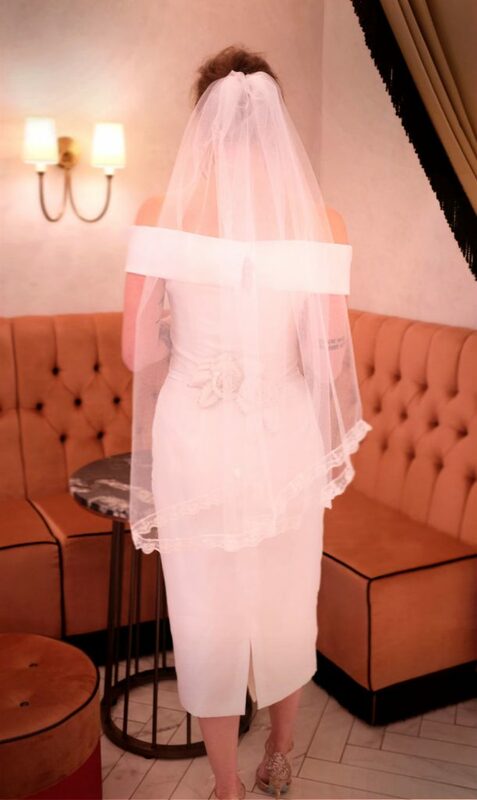 I used some very soft veiling that I had left over from a previous client and positioned the narrower strips of lace (unpicked from the princess seams and sleeves of the original bridal gown) on the curved bottom edge. I then zig-zagged along the embroidery and trimmed away any excess veiling. I didn’t have a veil on my own wedding day, so I actually enjoyed wearing this in the shoot. I thoroughly enjoyed working on this wedding dress refashion. I really wanted to demonstrate how sustainable bridal wear can be and I hope I achieved it. I used only materials from the original dress except for the veiling (left over from a client as mentioned above) and new polyester thread. 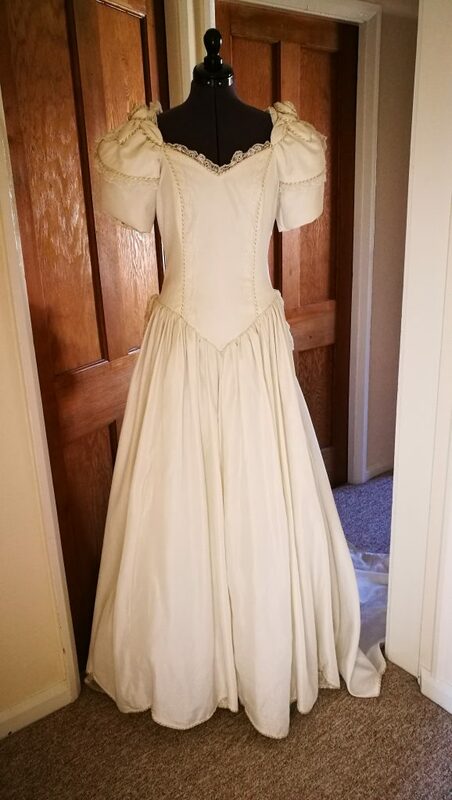 I didn’t make a toile either as the bodice was in good shape and the skirt block was my own drafting, meaning little fabric has been wasted or discarded. I have saved all leftovers and these will become a cape and bag. Any small pieces will be donated to my daughter’s pre-school for collage and crafts! The original dress also had a large crinolene underskirt to create its volume. There was absolutely nothing wrong with this so I have not used it and instead will save it for a future bridal design or client. For whatever reason, be it budget or wanting to wear a sentimental family heirloom, wedding dresses can be refashioned and altered to fit the modern bride, and I think it’s such a great way to find a unique gown for your special day. Not only will you have something truly individual, but also you’re helping to reduce the environmental impact that fashion, including the bridal industry can have. I’ll be publishing a follow up blog post this week about how wedding dresses can be ethical, so if you’re interested in learning more, please remember to come back and have a read. I also include ethical options in my bespoke bridal services, which you can read about here. Furthermore, if you’d like to ask me any questions about bridal alterations or upcycling a vintage dress, please feel free to contact me via my website. Credits: Major thanks and love to my incredible friend, Clare Sutcliffe, who took these fabulous photos.